" THE CHESS MATCH "
Welcome to "The Chess Match" as imagined by James, the professor of the imagination. “These characters are quite passionate about the game. You’ll notice that they’ve incorporated the checkerboard pattern into their clothing and even onto the castle walls. But, they’ve only learned the game as distant observers, somewhat like you or me getting fascinated over a rugby match on the Aussie Channel. We could get all excited, run into the backyard and form up a scrum but we wouldn’t know the nuances of the game. Still, we’d have all sorts of fun and maybe even lose some teeth in the process. “I had fun playing the different pieces off of each other,” relates James. “Knights, castles and kings all employ minions and ogres to move them about the field. The red bishop is very ‘Rome’, as if he has just arrived, ornate mitre and all, from a conference at the Vatican. His counterpart is a red-haired, crazy druid running around (technically, diagonally) with a bunch of skulls on his belt. You have the Napoleonic, Great Garabaldi pawn in the foreground very serious and very fired up for his role while his opposite number seems to be having trouble mustering any real sincerity.” Then, there’s the crowd that surrounds the main event. Advisors, apprentices and dragons are part of the action. 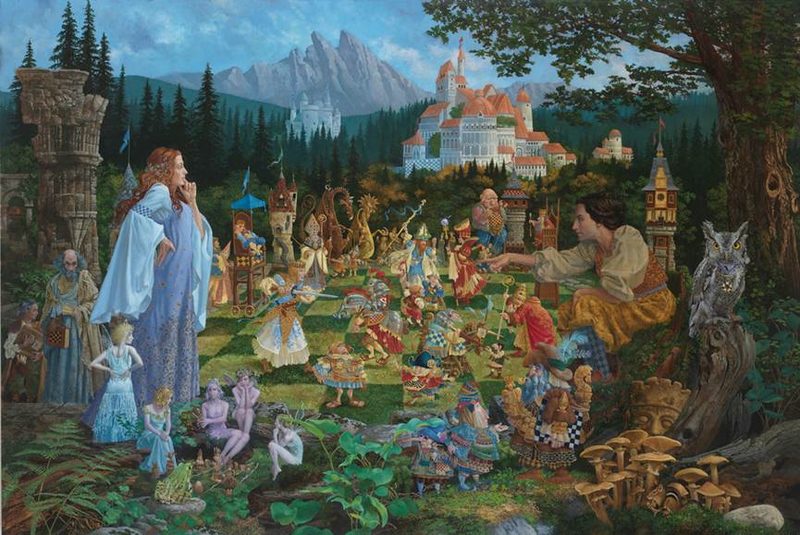 Like children mimicking adults, a group of faeries plays their own version of the game. A traveling salesman, in this case a “pawn-broker,” entices the locals with his wares. A chip monk hides in the woods holding a pawn. Has he swiped it, or is he looking to get in a game? An old, lost king lies half buried in the ground. Seventy-eight of his companions, known as the Lewis Chessmen, were discovered in 1831 on the Isle of Lewis, Scotland. These medieval ivory pieces date back to the 12th century and are believed to have been brought to the Scottish islands by the Norwegians, who ruled Scotland at the time.